Conaway Run Lake forms behind an impoundment in the Conaway Run Lake WMA. 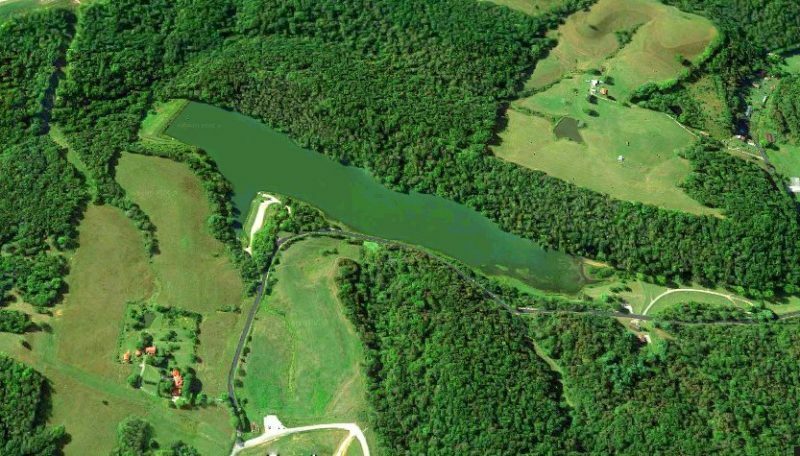 As part of the dam-safety program of the West Virginia Division of Natural Resources, Conaway Run Lake, near Middlebourne, in Tyler County, is undergoing repairs June 11-Oct. 31, 2018. Its boat ramp, parking lot, and the access road to its dam will be closed during this time, according to a release from the division. Bank fishing will be permitted during construction, though boating will be prohibited due to safety concerns. A maximum allowable drawdown of 10 feet may occur. The 30-acre lake accommodates fishing for trout, bluegill, largemouth bass, and channel catfish and is stocked with trout from February until May. Ten primitive campsites with vault toilets and well water and a 100-yard shooting range have been developed in the surrounding 630-acre Conaway Run Wildlife Management Area. The wildlife management area consist primarily of hardwood forest and brush cover, and game traditionally taken therein include deer, grouse, squirrel, rabbit, and migratory game birds. For any questions or comments, please contact Nate Taylor, Acting District Fisheries Biologist – Parkersburg, at 304-420-4550. Next articleNew hand-fishing season opens June 15 in W.Va.